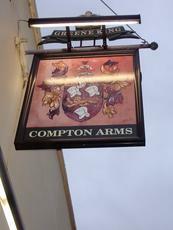 I went to the Compton Arms in Angel (located round the back of the Union Chapel) and I have to say it was a charming little boozer They had half a dozen or so ales including 'Old Nutty Hen' an autumn seasonal from Old Speckled Hen, which is a red version. I think it was George Orwell's local. Something of a football watching pub though. 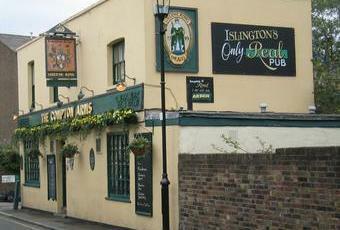 Visited for the first time tonight and found it quiet for a Thursday evening compared to other pubs in the area. Guess it helps being tucked away. Five ales on tap - three Greene King and two guests. Tried a pint of each of the guest beers which were very drinkable and £3.90 each (no Camra discount available). Food coming out of the kitchen looked nice and there was a sign by the bar saying all meals are a fiver on Monday to Friday before 3pm. Unobtrusive music, no evident TV screens, and people relying on the old-fashioned art of conversation. Would definitely visit again if I were in the area - although maybe not on an Arsenal match day as it apparently gets rammed then. I have to say that this pub is a real hidden gem. There seems to be new real ales from different parts of the country appearing all the time, despite the Greene King tie. I have eaten here a few times now and been impressed every time - there is nothing frozen going on here - a pleasant change from the branded stuff up and down Upper Street. The garden has been spruced up for the Summer and its a great place to chat and sup the warmer evenings away. The other good thing is you can watch a game on the outside TV. This is a proper pub, run as they used to be. No pretensions, no branding, unobtrusive music and great fayre. Worth seeking out down the lanes of Canonbury.